133. Deposits of starch, or farinaceous matter, in all these cases, constitute the thickening substance of the root, stored up for the future use of the plant. 136. The fulcra of certain endogenous plants originate high up the stem, and descending obliquely, enter the soil. Of this kind are the roots of the screw-pine (Panda-nus) of the conservatories, which are often several feet in length before reaching the ground. The figure represents a screw-pine which was wholly propped up by roots of this kind as if on stilts. Similar roots occur, in a smaller way, at the lower joints of the Indian corn. 137. 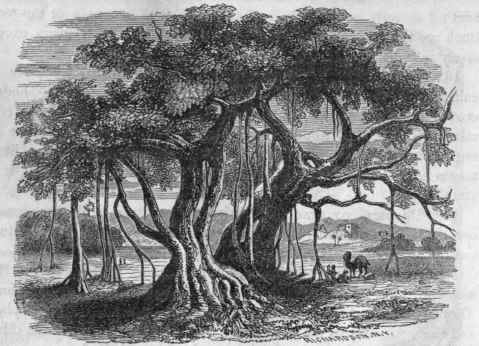 The Banyan Tree (Ficus Indica) develops adventitious roots on a grand scale. When the branches have stretched out so far as to need additional support, they send forth adventitious roots, descending to the earth. Having penetrated the soil, these roots become supporting columns. The branches continuing to advance, send down other roots, which in turn become columns similar to trunks, until a single tree becomes a grove capable of sheltering an army of men. 138. 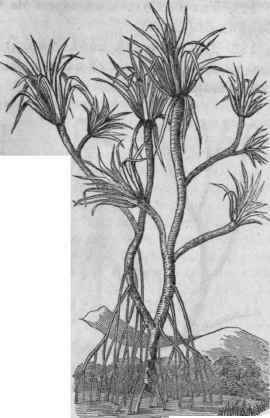 The Mangrove (Rhizopora), of the West Indies, sends down axial roots from its branches. The seed germinates before detached, sending down its long radical until it reaches the mud in which these trees grow. Thus the young plants gain a firm standing before quitting their hold of the parent tree. 139. To favor the development of adventitious ROOTS on any particular part, keep that part in contact with moist soil We often observe such roots to arise naturally, in prostrate branches or stems, at those points which touch the ground. In slips, cuttings, etc, the same thing occurs artificially. Hence to increase the roots of the potato vine, or corn, heap the earth against the stems. The madder plant, which is cultivated solely for the rich coloring matter in its roots, is successfully treated in no other way. Its adventitious roots are excessively multiplied by deep spading and high " hilling." 140. To produce dwarf trees it is only necessary, by any contrivance, to retain a quantity of moist earth against the base of the selected branch until it strikes root. Afterwards it may be severed from the tree and transferred to the soil. (Fig. 40, d). 6. Which should succeed each other in the rotation of crops; c. Which may be sown together in the mixture of crops. 142. To transform a tap-root to a fibrous. At a certain distance below the collum sever the tap-root without otherwise disturbing the plant The consequence will be an increased growth of the lateral or fibrous roots nearer the surface of the ground. ST. Old oak trunk with horizontal branch bearing epiphytes and parasites, a, A fern (Polypodium incanum). b, Epidendrum con-opseum). cc, Long moss (Tillandsia). d, Mistletoe (Viscum). e, Lichen. 143. 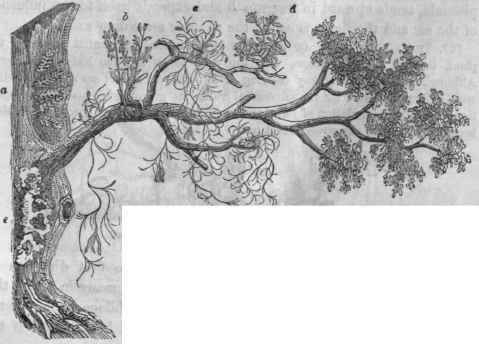 Epiphytes (em, upon, (øντον, a plant), a class of plants, called also air-plants, have roots which are merely mechanical, serving to fix such plants firmly upon other plants or trees, while they derive their nourishment wholly from the air. The long-moss (Tillandsia) and Conop-seum are examples. 144. Parasites - three classes. Very different in nature are the roots of those plants called parasites, which feed upon the juices of other plants or trees. Such roots penetrate the bark of the nurse-plant to the cambium layer beneath, and appropriate the stolen juices to their own growth, as the dodder and mistletoe. Other parasites, although standing in the soil, are fixed upon foreign roots, and thence derive either their entire sustenance, as the beech-drops and other leafless, colorless plants; or a part of their sustenance, as the cow-wheat (Melam-pyrum), Gerardia. 145. Subterranean stems. As there are serial roots, so there are subterranean stems. These are frequently mistaken for roots, but may be known by their habitually and regularly producing buds. Of this nature are the tubers of the Irish potato, the root-stock of the sweet flag, the bulb of the tulip. But even the true root may sometimes develop buds - accidentally as it were, in consequence of some injury to the upper axis, or some other unnatural condition.